Understanding and managing risk and uncertainty is a central task in contemporary societies characterised by rapid social, technological and environmental change. This book presents research approaches used by scholars who all share a passion to gain new insights in how individuals, organisations and societies approach uncertain futures and their potential dangers. The contributions illustrate the usefulness of particular methods and methodologies for researching risk in order to advance the understanding and management of social, technological and environmental challenges. 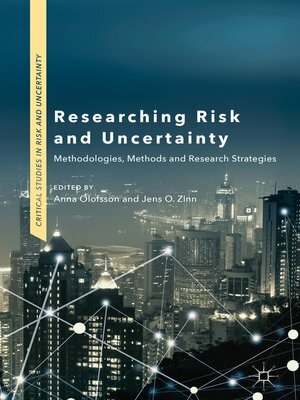 With research strategies and approaches from sociology, psychology, history, linguistics, anthropology, and gender studies, Researching Risk and Uncertainty provides guidance and inspiration to students and scholars across a range of disciplines interested in risk, disaster and social crisis.